Reform, however, is not always the result of technocratic tinkering and innovation but can be driven by popular, broad-based citizen action. Tweet Whether it be labor or environmental policies or various human and civil rights issues, social movements deploying various nonviolent tactics have consistently demonstrated the ability to achieve genuine – sometimes transformative – shifts in policy and government performance. The underlying dynamic involves grassroots organizing to amplify citizen voices and wield power. First, take cues from the grassroots. As was the case with the Indian Right to Information movement profiled in the aforementioned blog post, the entry point is not rallying the public around abstract fiscal transparency issues and technocratic measures, but linking these directly to immediate problems. “We would like to have proper toilets, fit to be used by humans, disabled people and children,” declared Bukela Gincana, a social audit volunteer in South Africa. Insufficient, substandard sanitation afflicts marginalized communities and can lead to gender-based and communal violence. Up to 50 people share one toilet, many with no locks, and women have been raped at night, reported residents in informal settlements in Cape Town. From 2015-2016, the Social Audit Network (SAN), Social Justice Coalition (SJC), the International Budget Partnership South Africa, and citizens engaged in two social audits focusing on sanitation service outsourcing. SJC, a “membership-based social movement” also launched a campaign to include the poor in budget decisions. Nonviolent tactics ranged from research, community organizing, education/training, engagement with locals/sanitation workers/officials, and advocacy, to physical inspections, protests, stunts, and citizen-state public forums. 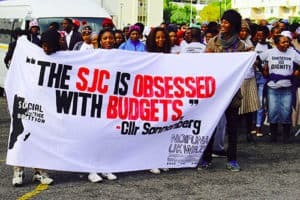 Finally, residents flooded the municipality with 3,000 formal submissions concerning the draft Cape Town budget, a creative mass action combining institutional and extra-institutional pressure. In 2017, SAN, IBP South Africa, and Planact conducted sanitation social audits in Wattville, near Johannesburg. Working with residents, elected officials, administrators, and civil society organizations, these efforts led to faulty portable toilets being replaced, improved relationships between government and residents, and a commitment to a collaborative approach to social accountability. Third, spice it up. To get citizens involved in fiscal transparency, civic initiatives have added contextually-relevant culture, humor, fellowship, and social recognition into communications, skills, leadership-building, engagement, and nonviolent tactics. Tweet In Wattville, community volunteers canvassed fellow residents. They wore easily recognizable in T-shirts with slogans such as, “Sanitation is dignity” and “Sifuna Ukwazi Iqiniso (We Want to Know the Truth). Fifth, develop incremental goals with tangible outcomes. According to scholar-practitioner Marshall Ganz, “without clear outcomes, neither leaders nor participants have any way to evaluate success or failure, to learn, or to experience the feedback essential to motivation.” How does this play out for fiscal transparency? Over two years, the Wattville social audits yielded new toilets, improved employment conditions for janitors, citizen input into the subsequent tender document, and more generally, improved citizen-state communication. Moreover, in 2018, SAN, IBP, Planact, and the Wattville and Thembelihle communities joined forces to expand social audits to ten informal settlements. The objectives are not only to improve fiscal governance and direct sanitation service, but to change government systems. In Paraguay – through annual mapping and visualizations of the administrative process, cross-data research and visualizations, and monitoring of selected schools – reAcción’s volunteers contributed to increasing FONACIDE’s transparency from the Ministry of Education down to Ciudad del Este. Recently, reports Riveros García, the General Auditor’s report sent to President Abdo Benítez included the youth group’s 2018 Annual Report on the management of FONCIDE funds.